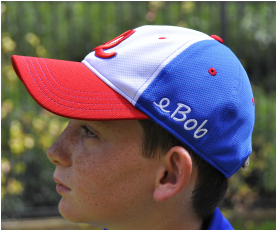 eBob's product line starts with hats (and when we say "hats" we mean visors too! ), of many styles, colors, and designs. The hat is the foundation of a good golf outfit, and the other components of the golf outfit should complement it. Many golfers don't consider the details of a hat when choosing one in a pro shop or golf store. Consideration may be given to size, basic color, and logo. However, failure to consider the finer details of a hat's design can lead to disappointment in a golfer's purchase - perhaps a hat that is seldom used or doesn't last long or worse yet, a hat that is worn but isn't well coordinated with one's outfit.